Accueil Produits Bande originale La bande originale de “La Coccinelle revient”. La bande originale de “La Coccinelle revient”. Sortie : 10 juillet 2006. Film : La Coccinelle revient. Cet album est une compilation de chansons présentes dans le long-métrage, sans contenir les musiques du compositeur. 1. First (par Lindsay Lohan) – 3:30. 2. Getcha Back (par Mark Mcgrath) – 3:08. 3. Walking On Sunshine (par Aly And A.J.) – 3:54. 4. Fun, Fun, Fun (par Caleigh Peters) – 2:17. 5. Magic (par Pilot) – 3:05. 6. Working For The Weekend (par Josh Gracin) – 3:35. 7. Roll On Down The Highway (par The Donna’s) – 3:32. 8. Born To Be Wild (par The Mooney Suzuki) – 3:54. 9. More Than A Feeling (par Ingram Hill) – 4:31. 10. Metal Guru (par Rooney) – 2:33. 11. You Are The Woman (par Josh Kelley) – 2:36. 12. Hello (par Lionel Richie) – 4:09. 13. Welcome To My World (par Mavin) – 3:58. 14. 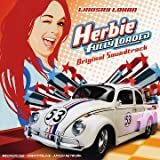 Herbie (Fully Loaded Remix) (par The Blacksmoke Organisation) – 2:49. 15. Herbie Vs Nascar (par The Blacksmoke Organisation) – 2:37.